Daughter Jessica has survived threatened cutbacks at her nonprofit employer, Metropolitan Family Service (MetFamily.org), and in fact was recently promoted. As a program coordinator, she oversees older volunteers, known as the Experience Corps, who work with kids in 11 "under performing" schools. Jessica previously was employed by SOLV, a Portland-based non-profit that strives to make Oregon more attractive and livable, Planned Parenthood and AmeriCorps. She is currently volunteering with Fences for Fido. Since May 2009, the all-volunteer group has unchained more than 235 dogs. Go to www.fencesforfido.org learn more about this worthy organization. The Levis, joined by two other attorneys, opened their own defense practice in February 2012 in downtown Portland. All four partners are experienced public defenders, having served clients in Multnomah and Washngton counties, Oregon. Elizabeth spent serveral months as a fulltime mom as well as a regular volunteer in her kids' school, but looked forward to returning to law practice. Nick, 25,was hired as an account manager by the giant web retailer. Nick is working out of the corporate headquarters not far from his North Seattle home. Leslie has won praise for leading in the formation of OLE -- One League for Everyone -- in the Seattle area. The program enables low-income, mostly Latina girls to play organized soccer by picking up costs of uniforms and equipment. The cost per child, per season, playing recreational soccer can range from $50 to $100, more than most participating families can afford. In registering families, Leslie discovered and overcame other barriers including forms in English, online registration and electronic payment. When her own children were little, she acted as a coach for their soccer teams. Her kids are now in their 20’s, so she decided to be a coach for the community. Leslie goes far beyond her duties as a coach though. She applies for grants and sponsorships. She gathers gently used soccer equipment and redistributes it. She encourages the parents to attend games even though they are intimidated about being one of the few Spanish-speakers. She also helps to creative sensitivity amongst the league parents and coaches about collecting money for various events, presents, and snacks. John observed his 70th birthday by bicycling 70 miles (actually, 73), albeit at a stately pace with a break for lunch at the 56-mile mark. John also has completed his 25th gallon of whole-blood donations; he still isn't completely drained! He did not try to duplicate the bike mileage feat on eight subsequent birthdays. Things went downhill, figuratively, for a while. After more than 40 years of serious cycling, he was forced off two-wheelers by a serous loss of balance. 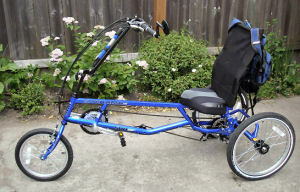 After 10 months of no cycling, John got back in the saddle, so to speak, with the big three-wheeler shown here. Its heavy weight (56 pounds) is offset by very low gearing, so the old guy gets around okay. But at age 80, John is definitely slowing down, and also falling down. The four hardy cruise takers, plus John Barnes, an intrepid journalist who worked with John 50-some years ago on the Buenos Aires Herald, traveled from different parts of the country for a get-together organized by Sam Haskins. The dates were June 14-16, 2011. The five of us had a nice taco luncheon on the beach near the Cliff House. After lunch, a couple of us went on a drive through Presidio Park and a visit to the aquarium. San Francisco was beautiful in bright sunlight.We had a splendid dinner at the St. Francis Yacht Club arranged by George Sayre, a former commodore. Click here to see and hear John in action. Just four days before his 77th birthday, John had a new civic experience: testifying before the Portland City Council in support of a proposed bikeway that would run through his neighborhood. His participation was sought by project sponsors -- certainly not because of his limited speaking ability or minimal knowledge of transportation issues. Although no one said as much, his main and perhaps only credential was his ripe old age – so the council would not assume the young and fit were the only beneficiaries. John has been bicycling a long time and, with the help of projects like the new bikeway, hope to carry on for at least a few more years. Sally Evans died of cancer at her Malibu home on June 25, 2009. She was 72. Besides John and their other sister Annie Gregory, Sally is survived by her husband Sandy, four children and two grandchildren. She was truly a blithe sprit. Everyone who knew her liked or loved her. Although she died too young, Sally had a full and happy life, and a very productive one. Among many other things, she and Sandy produced three great children. "Even near death, Sally still spread sunshine over those of us who stood around her bed," said an old friend, John Barnes. John's Aunt Harriet, a gifted and much acclaimed writer, was the last of her generation of a remarkable family. Although something of a celebrity in her later years, she remained completely unaffected by it all. With her abundant talent and modesty, she was a model for us all, especially those of us who are no longer young. She was 91 when she died, outliving by many years her three sisters, among them John's mother. John's old boss, former Congressman Lionel Van Deerlin, died May 17, 2008, at age 93. He was an institution in San Diego, with a local history dating back 70 years. Click here for a tribute prepared by John.